I feel a little late to the game because I normally start sharing gift guides in early November, but I finally got the first one ready for y’all! I did a poll on Instagram last week asking which guide y’all would like to see first and there were so many great suggestions, but “for the guy” came out on top. 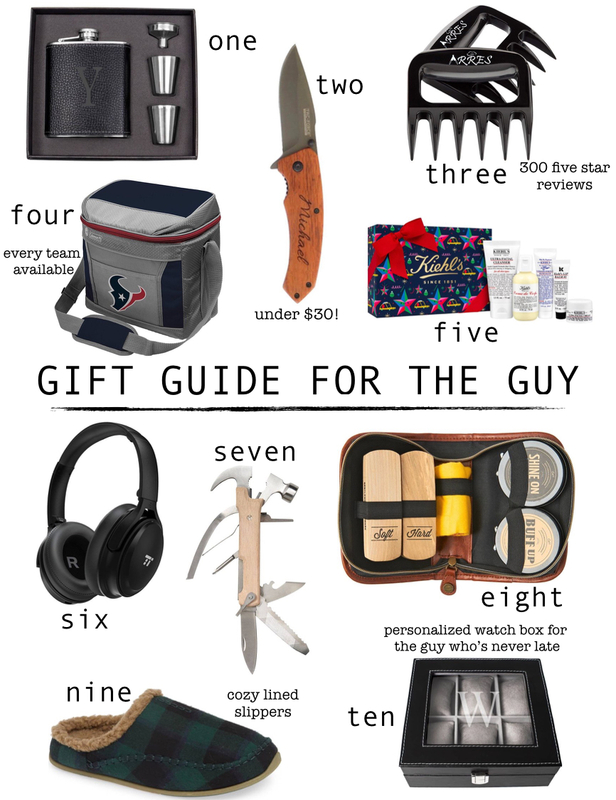 So without further ado, I present to you 10 items that any guy on your list would be happy to receive! And the best part is they’re all under $60. ONE: Monogram Flask Set- Personalized gifts just feel so much more, well, personal. This flask set is classic and quality, and a great deal for under $50 with free shipping. TWO: Tac-Force TF-922 Speedster Assisted Opening Pocket Knife- Safe to say that every time I’ve asked Z for gift ideas in the past, he always says some sort of pocket knife. This one is under $30 with laser engraving, has great reviews, and ships within 2 business days so you’ll have it in plenty of time for Christmas. THREE: Arres Pulled Pork Claws & Meat Shredder- The man who loves to grill will thank you for these “pork claws” that have amazing reviews and are under $15. FOUR: NFL Soft Sided Cooler- For the sports enthusiast, there’s no better gift than a cooler with their favorite team on the front. We have had one of these “12 pack” Coleman coolers for years and it’s held up incredibly well- we love using it on road trips and vacation. All teams are available and most are $20 with free prime shipping. FIVE: Kiehl’s Mighty Moisture Set- Guys like to be pampered too, ya know. This set comes in a holiday box with a bow so you don’t even have to wrap, and your guy will be set to keep that manly skin hydrated through the winter months. SIX: TaoTronics Active Noise Cancelling Bluetooth Headphones- We have and LOVE these headphones so I had to include them on this list. The noise canceling is legit- you cannot hear anything when you have these bad boys on. Your guy can finally watch his game in peace while you blare Backstreet Boys in the background. SEVEN: Wood Hammer Multi-Tool- Another universally great gift that any guy would love to have. Includes hammer, flat head screwdriver, bottle opener, reamer, saw blade, file, knife blade, phillips head screwdriver, pliers, & wire cutters. Under $20! EIGHT: Gentleman’s Black Shoe Polish Kit- A useful $25 gift that any guy will appreciate. Would be great for a hard-to-shop-for FIL! Kit comes complete with soft and hard brushes, cleaning towel, shine and buff polishes. NINE: Deer Stags Nordic Slipper- Currently on sale for $22 (free shipping) and come in three colors. Guys can never have too many slippers and I love the plaid on these. TEN: Monogram Watch Box- Grab this while it’s currently on sale for 20% off with free shipping! If your guy has started a watch collection, he could use this trusty personalized box to store his timepieces. I didn’t include any clothing items on this list because I feel like that’s a pretty personal preference for most guys and if you’re buying someone a shirt or sweater, you probably already have a good idea what you’re looking for. If not, Patagonia is always a good option! I plan on doing 5 or so more gift guides, and I’d love to know what you want to see. If you have any specific requests (i.e. for the teacher, babies, stocking stuffers, etc.) please leave them in the comments! Happy December, friends!!! It’s officially my favorite month out of the year and I couldn’t be any more excited about it. Then again, seeing Bear’s excitement makes me think I could be…because all he’s talking about right now is Christmas. Pretty sure he inherited his love for the holidays from his Mama which makes me very happy and want to do all things festive! Bring on the cookie baking, gingerbread house making, and Santa picture taking we can possibly fit into the next 30 days :). A few weeks ago, I had some girlfriends over to the house for a morning of muffins, hot cocoa, and girl talk. Dress code: jammies. There are few things these girls and I love more than cozying up in holiday pajamas and watching a good Hallmark movie. Anyone else? I saw this morning that there are several new royal-inspired Christmas movies on Netflix and I nearly fell off the couch, I squealed so loud…you better believe I will be watching both of them tonight after the boys are in bed. One of them looks like a holiday version of The Parent Trap and stars Vanessa Hudgens, which I can’t wait to watch. Have you seen them?! In case you missed it, Jess, Kylee, Shelbi, and I are giving away two $100 Nordstrom gift cards on Instagram! It’s super easy to enter and you can pick out holiday pajamas (or whatever you want!) for you and your bestie. Hope you’re all having a fun, festive weekend!